This is a pre-drilled Mud flap for Ford Expedition, approximately 12 inches wide by 3/8 inch thick, designed to hang approximately 8 inches below the fender well. Application: FRONT of all 2007 thru 2017 stock Expeditions. Mounting: Duraflap mounting hardware is made of stainless steel where available. Other mounting products are made of anti-corrosive and rust resistant materials. Our drill-less Mudflaps are custom designed to utilize existing factory holes and other mounting points available on your truck. One hole will need to be drilled thru the fender well liner on some models. Serviceability: This Mudflap is pre-drilled and requires no drilling of additional holes in the metal of your Expedition. Allows for easy & precise alignment, and drill-less installation. This Mud Flap for Ford expedition is a Drill-less Mudflap, approximately 12 inches wide by 3/8 inch thick, designed to hang approximately 9 inches below the fender-well. Application: Rear of all 2007 thru 2017 Expeditions. Mounting: DuraFlap mounting hardware is made of stainless steel where available. Other mounting products are made of anti-corrosive and rust resistant materials. 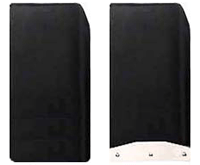 Our drill-less Mudflaps are custom designed to utilize existing factory holes where available and other mounting points available on your truck. There are several different trim packages on the Expedition, so to insure that we send you the right mud flap for your trim package, you will want to measure the distance between the two holes in the fender well lip. Include this measurement in your questionnaire comments section. Serviceability: This Mudflap is pre-drilled and requires no drilling of additional holes in the metal of your Expedition. Allows for easy & precise alignment, and delete drill-less here drill-less installation.